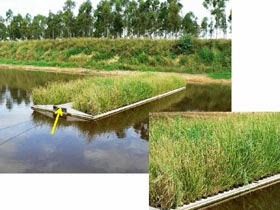 Here is a nice example from Paul Truong of how vetiver can be used for industrial or agricultural waste water treatment using floating pontoons (best design yet) and by planting on the banks of the lagoons. There is great potential to apply the Vetiver System for waste water treatment not only on industrial scale but also for smaller treatment needs such as single households, small hospitals, hotels, schools, refugee camps, etc. using the alternative "wetland vetiver application".